If your innovation efforts currently do not include exploring dairy-based foods outside traditional dairy spaces, it’s time to get out of your comfort zone and get creative. This may require the use of dairy ingredients, everything from simple nonfat dry milk to whey protein crunchies, or just making fluid milk work harder for you. For example, let me introduce you to Numa Milk Chews, which are milk-based chewy snacks infused with nuts and dried fruit. 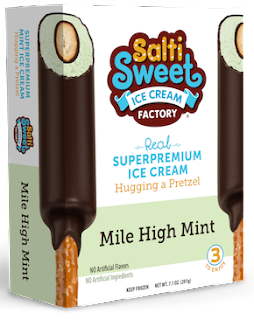 They are inspired by Taiwanese nougat, an extremely popular Asian treat, which until now has only been available in the U.S. as an imported product. The name Numa comes from the Chinese characters for daughter (nu) and mother (ma), and that’s who developed this new shelf-stable dairy snack: Joyce (the nu) and Jane (the ma). The all-natural chews are described as tasting like candy but performing like a bar. Not too sweet, they are a good source of calcium and iron with one serving (two chews) providing 4 grams of protein. Packages state: You’ve never had milk like this before. 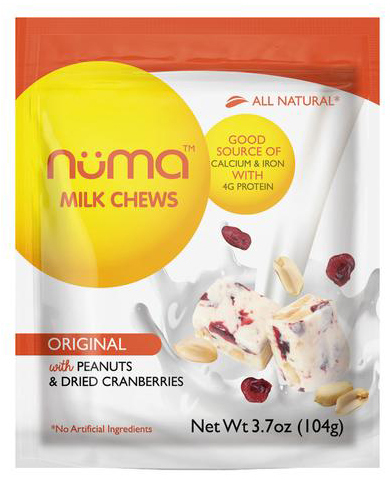 Made with just six ingredients—with Grade A Pasteurized Milk the second ingredient—Numa made its launch in an Original flavor (with peanuts and dried cranberries) in 2017 in select New York City stores and through Amazon in early 2018. The mom and daughter team just launched a Kickstarter campaign to assist with the rollout of Chocolate and Strawberry flavors. Here’s a few more out-of-the-dairy-department innovations. PepsiCo’s Frito-Lay division is rolling out a range of yogurt- and cheese-based snacks. 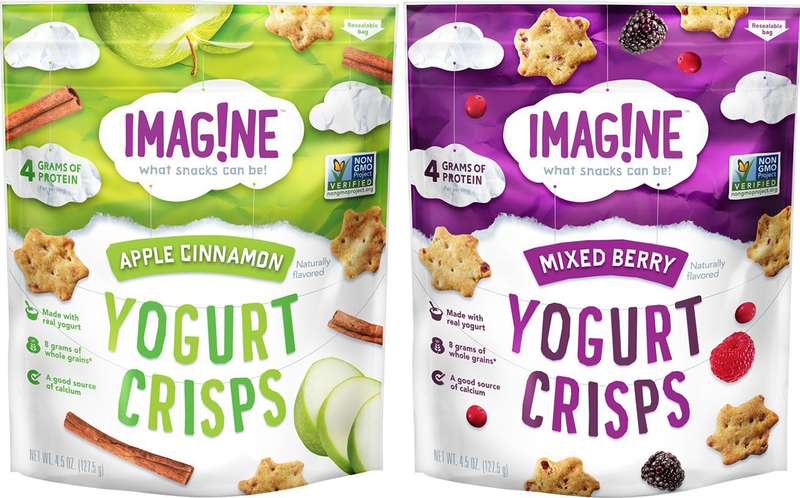 Targeted to kids, new Imagine brand shelf-stable snacks make dairy the star ingredient. Imagine Cheese Stars are poppable crackers with real cheese as the first ingredient. Initial offerings are Parmesan and White Cheddar, which both containing 6 grams of protein per serving. 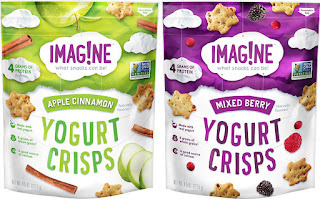 Imagine Yogurt Crisps combine real fruit with real yogurt for a crunchy whole grain snack that comes in Apple Cinnamon and Mixed Berry. Nonfat yogurt powder is the first ingredient, with a serving containing 4 grams of protein and 8 grams of whole grains. 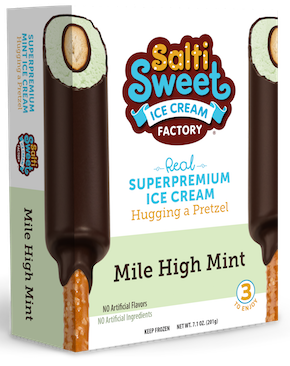 It’s been more than a year since Prairie Farms Dairy Inc., introduced a new dairy concept into the refrigerated case: Milk Snack Bars. The perishable two-layer whole milk crème-filled chocolate cake bars are dipped in chocolate and have a short, simple ingredient list and do not contain artificial colors or preservatives. TSC Food Products GmbH, Austria, which worked with Prairie Farms on Milk Snacks, showcased similar new products at SIAL 2018. 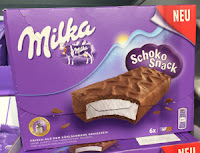 Product will be rolling out to select European markets under the Cadbury and Milka brands. 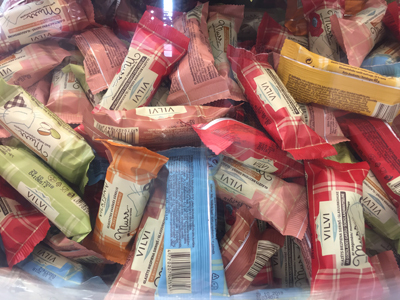 Vilvi, Lithuania, showcased its quark bars at SIAL. These bars are composed of an inner filling of quark (fresh cheese curd) encased in a thin chocolate coating. The quark comes in many flavors, including basics like chocolate and vanilla, as well as more adventurous like poppy seed, mascarpone and pistachio. Imagine if these perishable bar snacks included an extra dimension of taste and texture by having the chocolate coating topped with flavorful whey protein pods. This would boost protein at the same time. They could even be colored for extra allure. 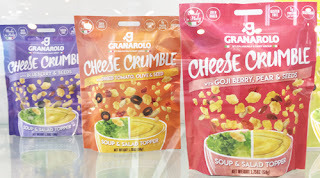 Another innovation that debuted at SIAL was Cheese Crumble from Granarolo Italian Milk and Dairy Group. 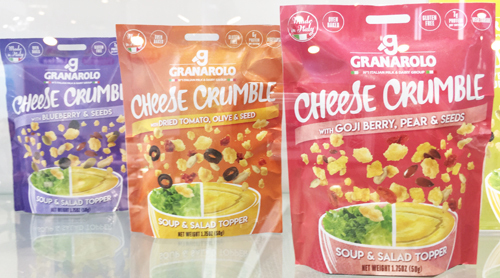 This new topper combines the company’s classic oven-baked 100% Italian cheese crisps with other flavorful ingredients, namely dried fruits and seeds. The topper is intended to be used in salads, soups or any food that can benefit from some extra flavor. Think cottage cheese and plain yogurt. The three varieties are: Blueberry and Seeds (flax, pumpkin and sunflower), Dried Tomato, Oliva and Seed (sunflower) and Goji Berry, Pear and Seeds (flax and sunflower). Here’s another example of a processor reimagining dairy foods. 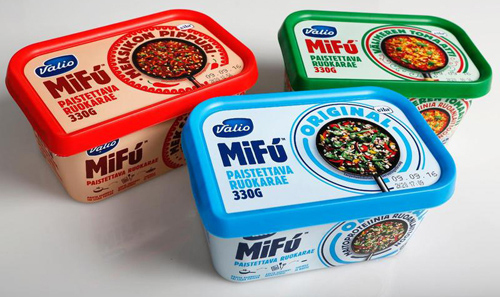 Finland-based Valio has developed Valio MiFU, a dairy-based product that substitutes for meat or poultry in recipes. Made from Finnish milk using proprietary technology, MiFU comes in strips and is ready to eat. The story of Valio MiFU products started when Valio’s internal innovation team was assigned the task of coming up with a new way to use the casein protein found in milk. The starting point for product development was to find alternative protein sources to meat. Many challenges had to be overcome before the successful end result. MiFU is best when used in hot meals as is or after browning in a frying pan. MiFU maintains its texture and mouthfeel well when heated. Valio MiFU is 24% protein and is free of lactose, gluten, eggs and yeast, so the strips are suitable for many special diets. 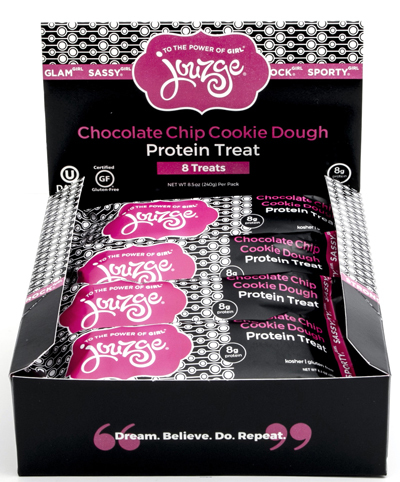 Back in the States, another new concept in dairy snacking is Jouzge, a line of dairy-based shelf-stable snack bars developed to promote healthy eating and a healthy self-image among young women. 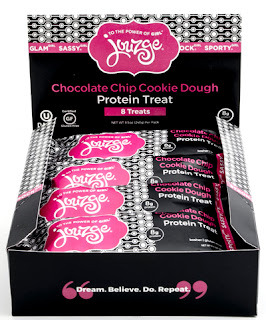 Created by University of Wisconsin-Madison (CDR) alumnus Dana Wendt, with formulation assistance from the Center for Dairy Research, Jouzge bars were born out of Wendt’s desire to create a dairy-based snack for young girls that would fuel their self-love, rather than disparage it. Growing up in the dairy industry, Wendt was aware of the health benefits of milk and milk products, so she was eager to create a dairy-based bar. For several months, she worked with researchers at CDR and experimented with a variety of different formulas, bar shapes, sizes, coatings and drizzles. Utilizing dairy proteins was an important part of the formulation process, which included the use of whey protein concentrate, whey protein isolate, milk protein isolate and whey protein crisps, which created a crunchy texture in some of the bars. The CDR team helped Ms. Wendt create three flavors: chocolate peanut butter, chocolate mint and chocolate chip cookie dough. Filled with dairy goodness, each clean-label bar contains no more than 130 calories and 7 grams of sugar, along with 7 to 8 grams of dairy-based protein. Canadian dairy cooperative Agropur is launching Inno Accel, a North American accelerator for dairy businesses. Inno Accel is an offshoot of the Inno Agropur program, a large open innovation initiative in the North American dairy industry. It matches Agropur’s resources with high-potential start-ups in order to reinvent dairy and quickly bring the most exciting innovations to market. U Main, a Montreal company that develops do-it-yourself artisanal cheesemaking kits. Sweetaly Dolceria, entrepreneurs who make decadent desserts using simple ingredients and their Italian grandmother’s traditional recipes. The group will spend four months at Inno Accel, disrupting convention and thinking outside the box. Each business will be supported by two mentors--a successful entrepreneur and a member of the Agropur executive--and about 20 coaches with different areas of expertise, e.g., marketing, sales, research and development, etc., who will provide guidance and help them develop their enterprises in an environment that resembles real-life conditions in the business world and the food industry. Agropur launched its innovation program in 2016 to explore new avenues in a fast-changing business landscape and to keep focus on better meeting the needs of consumers for a unique dairy experience. Reimaging dairy foods. The possibilities are infinite.